I know it's an odd thing to review, but others may be searching for this, as well. I'm not a super bike tech expert, so figuring this out was not obvious to me. This 160mm to 180mm adapter will also work to convert a post mount road bike from 140mm to 160mm. So, for those with the R785, and now the R685 brake systems from Shimano, fitting to 140mm spec'd bikes, you can easily run a 160mm rotor (provided there is frame clearance) with this converter. 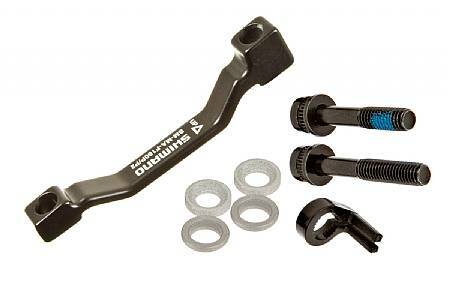 It's inexpensive, comes with the longer bolts you'll need, and is just as easily adjustable as direct-attaching the brakes. It works in front or rear, again, provided you have the frame clearance, which most road bikes seem to (always check with your manufacturer first).